Have you had any mini dessert shooters yet? They are so, so cute! 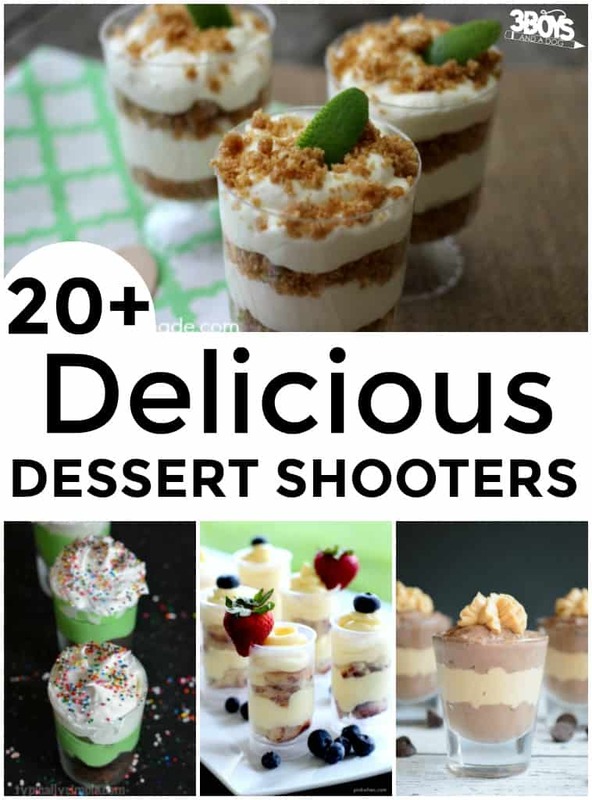 Basically, shooter desserts are tiny versions of classic desserts that are served in tall shot glasses. They’re adorable and yummy and, if you’re watching your weight, they’re a great way to get a little something sweet without going overboard. And, because they’re all individually made, they’re perfect for parties! 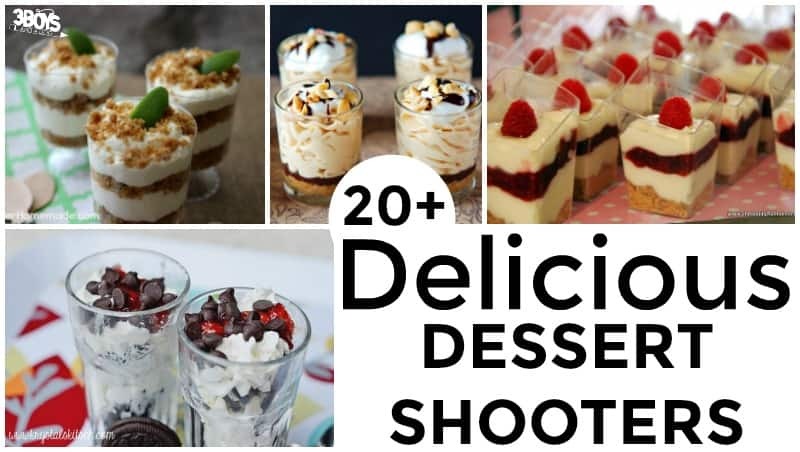 If you want to serve some bite-sized treats for your guests, take a look at this list of over 20 mini shooter dessert recipes! There are desserts here that everyone will love, even your pickiest little one! Can’t get enough of mini sweets? 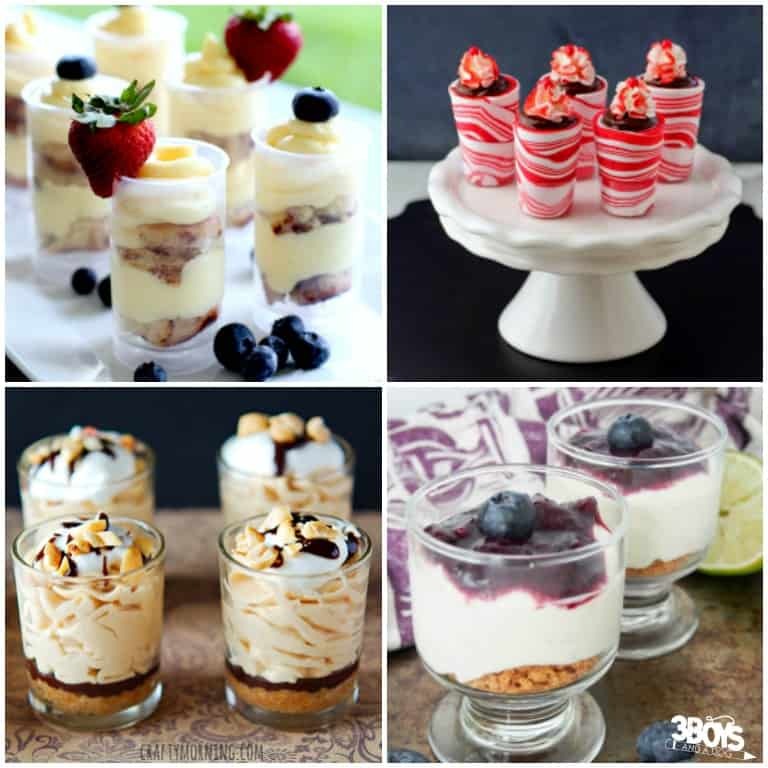 Check out this list of 15 mini dessert recipes you can serve any time! 1. Try these teeny Caramel Apple Pie Shooters with a little dollop of whipped cream! 2. Speaking of cream, these Peaches and Cream Shooters look delish! 3. Or, if you prefer a different fruit, you can try these easy Raspberry Cream Dessert Shooters! 4. I cannot get enough cheesecake, but my hips sure can. LOL! I love the idea of these No-Bake Lemon Cheesecake Shooters! 5. Want to serve something gorgeous and colorful? Try these Unicorn Cheesecake Shooters! 6. Banana pudding is a classic Southern dessert, so I know these Banana Pudding Shots are wonderful! 7. I just love the taste of Key Lime Pie. I can’t wait to try these Key Lime Cheesecake Trifles! 8. The kids will gobble up these Chocolate Pudding Shooters! 9. Add a touch of elegance with these Lime Mascarpone Cheesecake Shooters! 10. You can’t get much easier than a dessert you don’t have to bake, like these No-Bake Peanut Butter Cheesecake Shooters! 11. Love carrot cake? Be sure to make a batch of these Carrot Cake Shooters! 12. Do you like the taste of chocolate and mint? Don’t miss this recipe for Mint Brownie Dessert Shooters! 13. Skip the oven and serve these delicious Key Lime Pie Shooters! 14. Who doesn’t love Oreo cookies? These Oreo Cheesecake Shooters are sure to be a big hit! 15. Awww…these Mini Strawberry Shortcake Shooters are simply adorable. They’d be perfect for a brunch! 16. Try serving these Cinnamon Raspberry Dessert Shooters as an afternoon snack for the kids! 17. Since these 3-Ingredient Chocolate Peanut Butter Shooters only require a couple of ingredients, your little ones can make these with you! 18. These Salted Caramel Cheesecake Shooters look so good. Try them with espresso! 19. Don’t worry! These Gummy Worm Jello Shooters are nonalcoholic and totally kid-friendly! 20. Serve these Chocolate Strawberry Cheesecake Shooters with tiny little spoons so guests can get all the yummy goodness! 21. These Candy Cane Shooters are actually served in candy cane shot glasses you can eat! Neat-o! 22. Oh my. My two favorite desserts, cinnamon rolls and cheesecake, in one treat. I just know I’ll be making some of these Cinnabon Cinnamon Roll Cheesecake Shooters! These affiliate resources from Amazon are just perfect for making your own mini shooter dessert recipes! Wow, what a roundup! Thanks for sharing with SYC. Love all of these! Thanks so much for sharing at the To Grandma’s House We Go DIY, Crafts, Recipes and More Link Party! Pinned this! Hope to see you link up again this Wednesday! I’m with the kids, I’d go for the chocolate shooters!! Thank you for sharing on #OMHGFF this week! Pinned to share!